When it comes to exercise, more isn't always better. If you work out too hard, you might find yourself getting nauseated, feeling dizzy or shaking. If you keep pushing yourself, you might even throw up. Those symptoms aren't just annoying; they can set you up for health problems. Fortunately, with a little information, you can keep yourself healthy while working out. 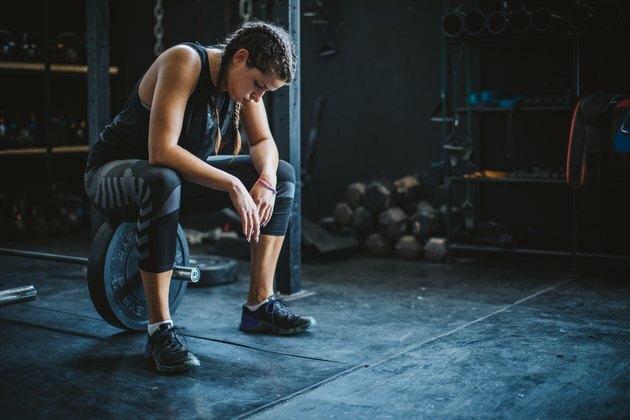 Some athletes view nausea, shaking, dizziness or even vomiting as a badge of honor, according to Lon Kilgore, Ph.D., of CrossFit Santa Cruz in California. However, there is no honor in hurting yourself by exercising too much. Dr. Kilgore reports that intense exercise interferes with your digestive system's functioning, and if you throw up, you expose the lining of your esophagus to harsh stomach acid, potentially damaging it. Intense exercise causes nausea, weakness, shaking and dizziness in a variety of ways. First, intense exercise pulls blood away from the lining of your stomach and intestines, which can cause nausea, says Dr. Kilgore. If you aren't careful to drink enough water during exercise, you can become dehydrated, which can cause dizziness. Shaking is a common response to fatigue and exhaustion. Although rare, nausea and vomiting may also be caused by more serious medical conditions. According to the National Institutes of Health, other possible causes include heat stroke, acute renal failure and gallbladder adhesions. If you start getting sick to your stomach, feeling dizzy or feel your muscles start to shake while you are exercising, responding properly can help you avoid health problems. If you're not done with your workout, you may find relief from something as simple as reducing exercise intensity. However, if you experience severe dizziness, sit down immediately so that you don't fall and hit your head on something, which can cause a concussion. Keep dizziness and nausea after a workout at bay by taking a few precautions. If you're new to exercise, start slow and gradually work up to higher-intensity workouts. You can also use the "talk test." According to researchers at the University of New Mexico, "When an exerciser reaches an intensity at which he or she can 'just barely respond in conversation,' the intensity is considered to be safe and appropriate for cardiorespiratory endurance improvement." You can also keep track of exercise intensity using your heart rate. Stay in your target heart rate range and you won't overstress your system. Although experiencing dizziness and nausea after a workout can be a normal symptom of dehydration, lightheadedness may be a symptom of a heart or lung condition, states Harvard Health Publishing. Dizziness may also be a symptom of low blood pressure, which can result in shock and be life-threatening in extreme cases. Chest pain, joint pain and shortness of breath when doing an activity you normally do easily are also symptoms that require medical consultation. If you experience these symptoms, contact your doctor to rule out or treat any underlying conditions and adjust your exercise routine to address your symptoms. University of New Mexico: The "Talk Test"